I have been eagerly awaiting this awesome beast since I first saw the initial posts about it on Aisle One some time ago. For heavens sake, a typographic skateboard! This is just as good as it get’s for a typo fiend such as myself. 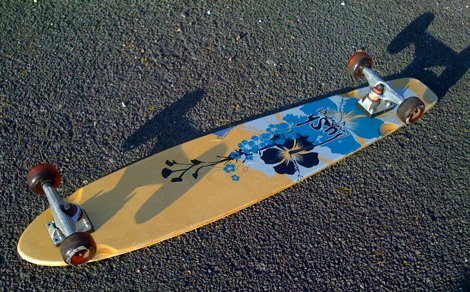 I am bit of a outside type (sort of pun intended) of person, and do own a rather nice Lush Long Board Skateboard. I can sometimes been seen cruising up and down the promenade been pulled along by my trust hound, Dylan. I know that’s not the point of a skateboard, as in you are generally meant to skate them as such. Which I do do from time to time, but when you have a willing hound, it’s hard not to pass up on a free ride. My Lush board is pretty long and comfy, and bloody fast, so it’s nice just zooming past all the oldies. So I have ordered one of these beasts, but the chances are I will be offering up as a giveaway prize as I cannot really justify keeping it, since I already have a cool board already. So keep your eye’s open on my blog for a potential Buddy Carr Typographic Skateboard Giveaway. Or failing that, go and order one yourself. They are being sold for $160 plus shipping. Head over to the official site now for the complete low down on this beauty. The photo gallery is just mouth watering.